TSN: Bob McKenzie on Toronto Maple Leafs GM Kyle Dubas turning his attention to pending restricted free agents Auston Matthews and Mitch Marner now that the William Nylander situation is now over. 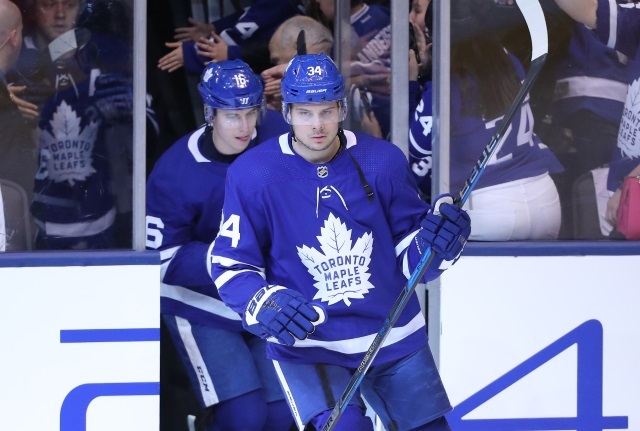 McKenzie believes that Maple Leafs would like to get negotiations going with both Marner and Matthews. “The first problem is, who goes first and who goes last? The sense seems to be that both guys would prefer the other guy to go first and then see where they’re at. And if nobody wants to go first then obviously the deal is never going to get done. So Toronto is trying to be proactive with negotiations but the potential Plan B would be to be more reactive. Dave Feschuk of The Toronto Star: William Nylander signed his six-year at just under $42 million over the weekend. There has been speculation that he could still be traded by the Maple Leafs at some point. According to Nylander, a trade won’t be happening. “Kyle has told me multiple times that as long as he’s here, he’s not going to trade me,” Nylander said Monday. NBC analyst Pierre McGuire on TSN radio yesterday doesn’t think that matters much. “Unless it’s written on paper, it doesn’t really count,” Pierre McGuire, the former NHL coach turned NBC analyst, said on TSN radio Tuesday. Nylander’s no-trade doesn’t kick in until the last year of his deal. He can submit a list of 10 teams he won’t accept a trade to. TSN analyst Ray Ferraro doesn’t think you should tell someone they won’t be traded.